New Delhi, India -- Tibetan medicine is popular and effective. It is mostly herbal medicine, but its uniqueness lies in the fact that in the course of its preparation it is blessed extensively with prayers and mantras, giving it more power. It is said that taking such medicine will either result in recovery, or, if the person is close to death, they will die quickly and painlessly. Blessed pills and blessed water are also used extensively. The more spiritually developed the person carrying out the blessings or the healing practices, the more powerful is the healing result. These pills often contain the relics of previous great meditators and saints, bestowing much power on the pills. Many Tibetan lamas actually blow on the affected part of the body to effect healing or pain relief. I have seen a person with AIDS with intense leg pain have his pain disappear after a lama meditated intensely and blew on his leg for twenty minutes. Visualisation can also be very powerful healing. One method is to visualise a ball of white light above your head, with the light spreading in all directions. Imagine the light spreading through your body, completely dissolving away all sickness and problems. Concentrate on the image of your body as completely healed and in the nature of light. In the Tibetan tradition, there are many Buddha figures (deities) which can be visualised while reciting their mantra. 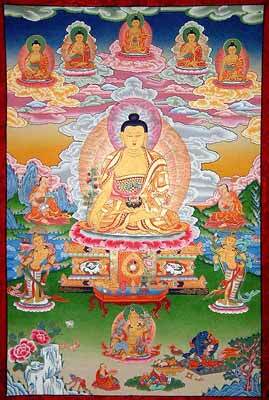 The Medicine Buddha; Chenrezig, or Avalokiteshvara (the Buddha of Compassion) are commonly used. Deities can be in peaceful or wrathful aspects. The wrathful ones are often used to cure heavy disease such as AIDS. If you are not comfortable with these images, you can use other objects such as crystals, or simply visualise all the universal healing energy absorbing into you, transforming your body into light, and imagine yourself as totally healed. Over the centuries many people have used these methods. The aim of these practises is to heal the mind as well as the body, so that the diseases or problems will not recur in the future.